Incoming Presidential Spokesperson Harry Roque said in an interview on Thursday that there will be no compromise in his character when he becomes President Rodrigo Duterte's mouthpiece. Duterte last week announced Roque's appointment, choosing the Kabayan Party-list Representative to replace Ernesto Abella, whom he had known for decades. READ MORE: HARRY ROQUE IS DUTERTE'S NEW PRESIDENTIAL SPOKESPERSON! 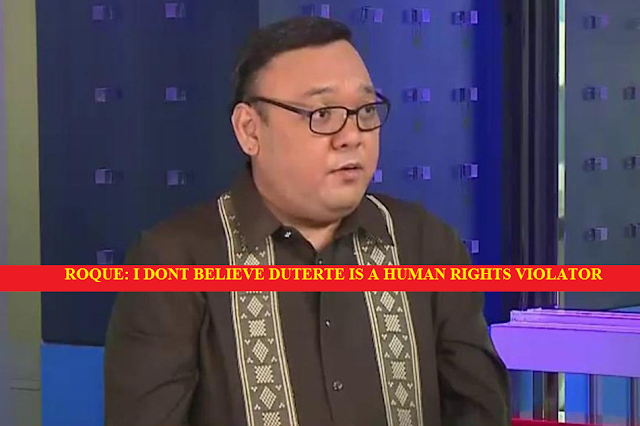 READ MORE: Harry Roque, nangakong bibigyan ng NOTICE yung mga WALANG HIYANG NANINIRA sa Pangulo! Critics have questioned Roque's acceptance of the post as he would be joining an administration heavily criticized for alleged human rights abuses in the drug war. Yet, Roque said he does not believe the President could have ordered the killings. "The perception is he’s behind the killings. I’m here to tell them as a lawyer, there’s no evidence that he ordered the killing and there’s no evidence that we’re in anyway in breach of our obligation to investigate and to prosecute," he said. "I take on a job and I take on a job with a purpose. I want to put the communication of the President in the proper legal context and I want to be instrumental in making history in this country, not just a witness to history in this country," he added. Roque said he will only speak of the President's stance and not his. "I will be (a) spokesperson. I will have to mouth the President’s positions on these issues. So I will say, the President supports the death penalty. Is that my personal belief? No, and people know it because of my voting record in the House," he said. "It’s not my business to argue about the policies of the President. My business is to restate the policy of the President and to provide the correct legal context in case he is not understood," he said. Roque said he accepted the position as the spokesperson to take advantage of the opportunity to call the police and inquire about the progress on the investigation and prosecution of the perpetrators. "Maybe that’s why God said we should give you this opportunity because that’s the most active and most effective manner in which I can contribute to solving one of our problems, the problem of killings," he said.